Astro has been long known as the gold standard for gaming headsets and now it has updated its wireless A50 headset with a fully customizable audio experience and a new wireless charging base. The new wireless gaming headset comes built on Astro's all-digital Command Center platform, allowing users to tweak every input and output, while also creating their own custom EQ profiles. Owners of Astro's A40 Tournament Ready edition headset should already be familiar with the interface. And for the uninitiated, the Command Center software lets you alter game volume, chat audio, mic, and AUX channels individually to generate custom audio mixes for streaming output. More importantly, the base station now acts as both a display stand and charging dock for the headset. The dock has a set of wells carved into it allowing users to stand the headset up and in the same divots is a set of corresponding power contacts. Users can plug in the base station into a PC as well as an Xbox One or PS4 depending on which version of the A50s they pick up. Meanwhile, the headset itself connects wirelessly to the base station over a 5GHz frequency and Astro rates battery life to 15 hours. 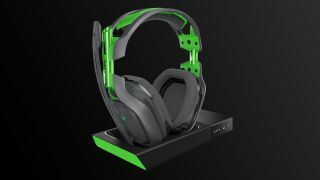 The Astro A50 wireless gaming headset will release later this summer for $300.